When considering treatment for obstructive sleep apnea or snoring, there are many choices. Often, treatment comes down to CPAP or a mouthpiece. Mouthpieces (oral appliances also known as mandibular advancement devices) are the leading alternative to CPAP. In brief, a mouthpiece may be the best treatment solution for snoring and sleep apnea simply because it is most likely to be worn each night. This is especially true for people with mild to moderate sleep apnea. CPAP machines are the "gold standard" for treating sleep apnea because they push air into you airway, keeping it open. However, many people who are advised to use a CPAP device stop wearing it shortly after receiving it. The common complaint is discomfort from the mask, it's required. When not used as directed for the entire night, a CPAP device is usually ineffective at treating sleep apnea. The severity of sleep apnea may make it necessary for some people to use a CPAP machine. For many, it is still worth trying to see if a mouthpiece will work. A mouthpiece may be recommended to someone if their CPAP treatment doesn't have good results. Both CPAP and a mouthpiece can be used together for the maximum benefit. CPAP work by using pressurized air which goes into the upper airway during sleep through a nasal mask and tube connected to a pump. The pressurized air acts opens the upper airway, preventing it from collapsing during sleep. A mouthpiece designed for the treatment of snoring and/ or sleep apnea works by advancing the lower jaw forward. Unlike CPAP, the device works by making it easier to breath as opposed to pumping air into the nose. A study conducted by the Journal of Dental Sleep Medicine indicates that for treatment of sleep apnea, both CPAP and a mouthpiece have similar overall effectiveness when used as directed. Sleep apnea is a chronic disorder so consistent usage of whatever treatment option is considered is one of the most important factors. To use CPAP adequately, it must be used 4 or more hours a night. NOTE: The SARAH Index and AHI are two different ways to measure stoppages in breathing while asleep. 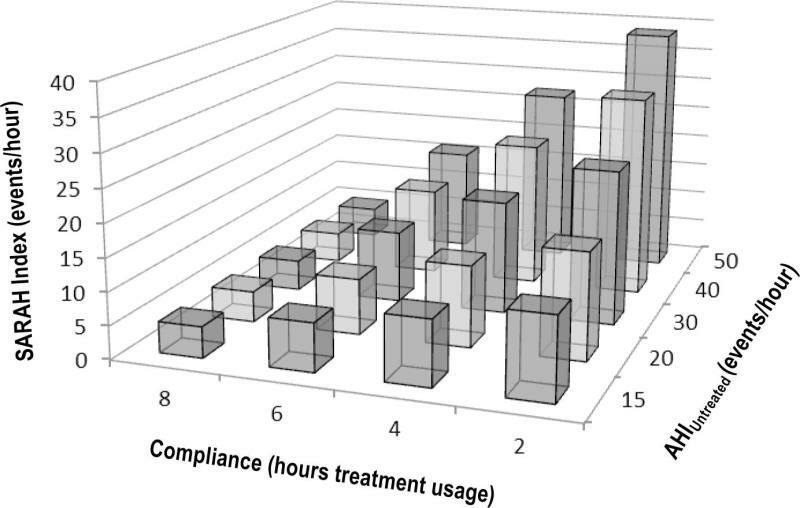 This chart indicates that CPAP is effective when used most of the night, as seen with the 6 and 8 hour usages. Most people do not wear the device for the full 8 hours, many wear the device less than 4 hours a night. This means that CPAP can only be considered effective treatment for sleep apnea when it's worn most of the night, which it often is not. In contrast to CPAP, mouthpieces are reported to be worn 95% of sleep time. 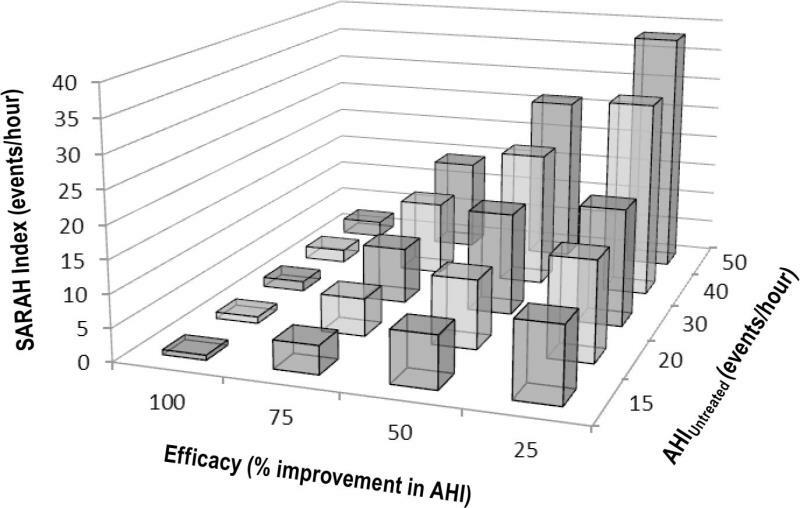 The improvement in breathing at night is high for many patients. It is possible for a person to wear a mouthpiece and use a CPAP device. Wearing a mouthpiece while using CPAP is considered the most effective treatment for obstructive sleep apnea, according to the Agency for Healthcare Research and Quality (AHRQ). Weightloss and surgery may also be effective but not as effective as wearing both a mouthpiece and using a CPAP device. 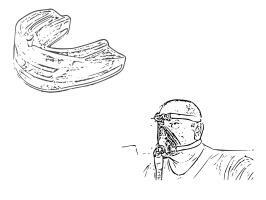 CPAP, A Mouthpiece Or Both? Based on the studies that have been done comparing mouthpieces to CPAP devices, a mouthpiece should strongly be considered as a treatment for sleep apnea. A mouthpiece is worth trying for anyone who was not successful with CPAP treatment. A mouthpiece is also a good choice for those with CPAP as it brings the most effective results. See reviews of mouthpieces for snoring and sleep apnea here.